CIRCUIT: Mondello Park National Track. SUNDAY EVENT INCLUDES: the Masters Motorcycle Show. CLASSES RACING: Superbike, Supersport, Pre-Injection, Supertwins & Production Twins, Sidecars, Moto 400 & Classic Superbikes (Saturday only), Junior Cup & Junior Supersport (2 races Saturday, 1 Sunday). 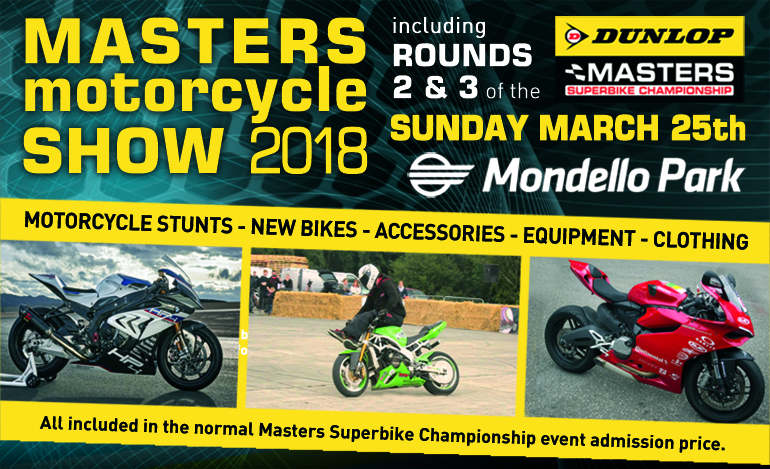 The 2018 Dunlop Masters Superbike Championship season opener, at Mondello Park on March 24th & 25th, will see the introduction of an exciting new initiative as Sunday 25th will include the first ever Masters Motorcycle Show. The new addition to the Masters calendar will see a large part of the Mondello Park paddock taken over by a Motorcycle Show, which will include both indoor and outdoor exhibits. Access to the show area will be included in the normal Masters admission price making this event the most attractive ever Mondello Park event for fans of Irish Bike Racing and motorcycling in general. Alongside rounds two and three of the Masters Superbike Championship additional motorcycle entertainment will be provided by the spectacular Irish Freestyle Stunt Series. 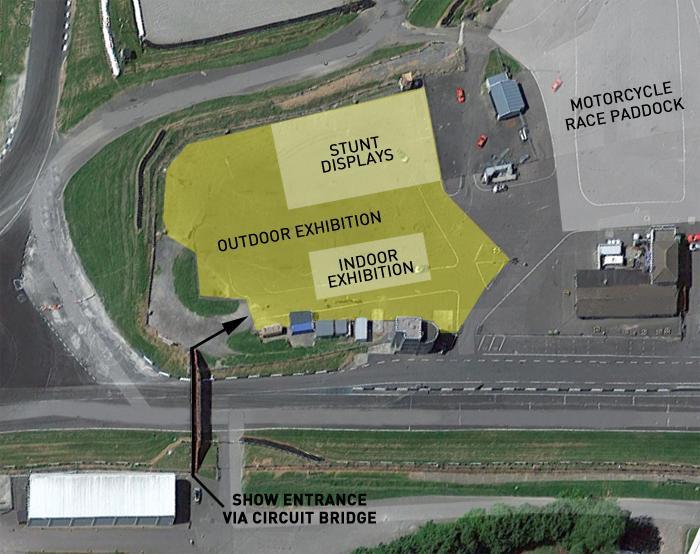 The stunt riders will perform in their own dedicated area within the Mondello Park paddock, which will also house displays of new motorcycles from BMW, Ducati and Yamaha, alongside motorcycle shops, Masters Superbike Championship partner Principal Insurance, a wide variety of motorcycle suppliers and service providers and the Road Safety Authority. While the paddock will look very different to previous events, the Dunlop Masters Superbike Championship will run to its familiar format with qualifying and Round One on Saturday and Rounds Two and Three on Sunday. A new and improved Sunday timetable will see races run to a more relaxed schedule, allowing event visitors time to take in the show exhibits in between their favourite race classes. Admission prices include entrance to the Dunlop Masters Superbike Championship and the Masters Motorcycle Show. Tickets can be purchased on-line (see button below) at the discounted price of just €12.50. Tickets on the day of the event are priced at €15.00. Under 16’s are admitted free of charge. All admission includes a complimentary event programme while stocks last. DATE: Saturday & Sunday March 24th & 25th. DATE: Saturday & Sunday April 28th & 29th. CLASSES RACING: Superbike, Supersport, Pre-Injection, Supertwins & Production Twins, Young Guns & Junior Cup, Lightweight Supersport & Classic Superbikes, Sidecars. TIMETABLE: Click HERE for a printable version. DATE: Saturday & Sunday May 26th & 27th. CIRCUIT: Mondello Park International Track. CLASSES RACING: Superbike, Supersport, Pre-Injection, Supertwins & Production Twins, Sidecars,Young Guns & Junior Cup & Classics. TICKETS: Click HERE to purchase tickets for August 25th & 26th. TICKETS: Clik HERE to purchase tickets for September 29th & 30th. TIMETABLE: For a printable version click HERE. To view the full 2019 Superbike & Supersport championship points see HERE. To view the full 2019 support championship points see HERE.